Joe Bochynski (Hobart '08) has written to tell us that he is showing a new public work in the Socrates Sculpture Park in Queens in New York City. The installation is part of the Socrates Annual, which bills itself as "an annual exhibition of new public art that addresses the most urgent issues of today." Joe's work will be on view for the next six months. The title of the work is "POTUS, 2017". It is 12-by-12-by-5 feet in size and uses tile, cement, and stanchions. Two photos are shown below. Joe was a double major in math and art who has gone on to make a career as an artist. Visit his web site at www.joebochynski.com. Alden Gassert joins the Department as a Visiting Assistant Professor for the academic year 2017–2018. Professor Gassert received his Ph.D. from the University of Massachusetts, Amherst. His mathematical interests include Number theory, Algebra, and Arithmetic Dynamics. Professor Gassert previous held a postdoc position at the University of Colorado, and he has taught at Western New England Universty. 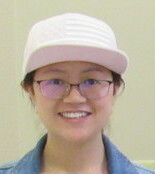 Yu (Phoebe) Cai will serve as the Math Intern for the Department of Mathematics and Computer Science for the 2017–2018 academic year. Phoebe is a 2017 graduate of William Smith College, where she majored in Mathematics. The Department awarded her the 2017 Catharine Adele Rippey '35 Prize for excellence in mathematics. As Math Intern, Phoebe will be available to offer help to students in calculus and precalculus courses. Luke Deluccia '15, who majored in computer science at Hobart College, was profiled in an article on the HWS web site, DeLuccia '15 Pursues Career in Robotics. Luke took a course in robotics and was inspired to pursue several independent studies on the topic with Professor John Vaughn. He also took part in a summer undergraduate research experience at the University of California, San Diego. He went on to graduate school at the University of Pennsylvania, where he completed an engineering master's degree in robotics in 2017. He has recently accepted a job with SRI International, a Stanford University spin-off that now serves as an independent, nonprofit research center. His position there focuses on vision and learning. Professors Kevin Mitchell, Carol Critchlow, and David Belding retired this year from the Department of Mathematics and Computer Science. David Belding was an undergraduate at Amherst College. He received his Ph.D. from Dartmouth College in 1980. Carol Critchlow was also an undergraduate at Amherst, and she received her Ph.D. from Cornell University in 1991. Kevin Mitchell was an undergraduate at Bowdoin College and received his Ph.D. from Brown University in 1980. Each of the three joined the Department in the year they received their Ph.D.
Belding and Mitchell are the authors of Foundations of Analysis, a textbook that has been used in Math 331. Mitchell is also the co-author of another textbook, An Introduction to Biostatistics. Critchow is the co-author of the CPSC 229 textbook, Foundations of Computation. 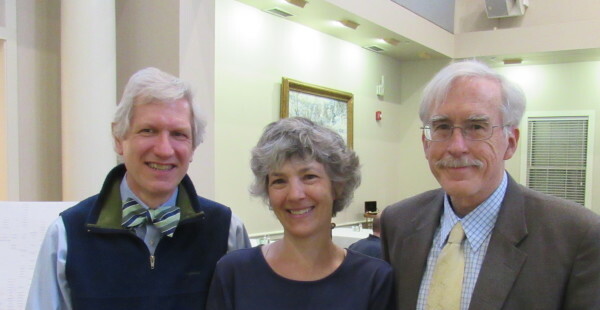 Although Mitchell, Critchlow, and Belding are no longer members of the teaching faculty, they continue as members of the HWS community as Professors Emeriti. The remaining members of the Department honor them for their service and wish them well as they move into the next phase of their lives. The Robert Beinert Prize, awarded to a a graduating Senior for excellence in Mathematics, Duncan Lilley. The John S. Klein Prize, awarded to a graduating Senior to recognize excellence in Computer Science, to Erin Condon, Duncan Lilley, and Brian Tosado-Prater. The Catherine Adele Rippey '35 Prize, awarded to a William Smith Senior to recognize excellence in Mathematics, to Yu (Phoebe) Cai. The Glenn M. Lee Prize, awarded to the Hobart Senior who has been most proficient in mathematics and athletics, to Sean Cunningham. The Abigail Mosey Book Prize, awarded to a Hobart or William Smith Senior for generosity in helping others to learn and appreciate mathematical ideas, to Casey Coffey and Mark Curiel. The William Ross Proctor Prize, awarded to the William Smith Sophomore who has achieved the highest rank in mathematics in her first two years at the Colleges, to Qingyi Lu. The Irving Bentsen Prize, awarded to the second year student at Hobart College who has the most outstanding record in mathematics and computer science, to Christopher Stedry and Philip Joon Yoo. Several mathematics and computer science students were elected to Phi Beta Kappa (ΦΒΚ) in 2017. 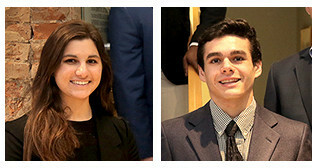 This year's senior inductees include math major August Bruno '17, math minor Katherine Campbell '17, computer science major Erin Condon '17, and computer science major Brian Tosado-Prater '17. In addition, Duncan Lilley '17, a double major in math and computer science, was elected last year as a Junior. And math minor Emma Gordon '18 was elected as a Junior this year. ΦΒΚ is a national honor society with chapters at many colleges and universities. Students are elected by current members of the chapter, who were themselves elected to ΦΒΚ during their own undergraduate careers. Two computer science majors, Maxim Zibitsker H'19 and Dominique DeRubeis WS'18 were finalists in the 2017 Pitch competition. The Pitch is an annual contest where students develop and promote ideas for products or services. The final contest was held on Wednesday, March 2. The four finalists competed for a $10,000 prize by presenting their projects to a panel of judges made up of four HWS alumni who have been successful in the business world. Maxim's proposal, "Aqua Salutem Technologies," was to develop a hardware and software system that could be deployed at beaches and pools to detect swimmers who are in danger of drowning and send alerts to lifeguards. The Stu Lieblein '90 Pitch was established to promote entrepreneurial leadership and is organized by the Centennial Center for Leadership of Hobart and William Smith Colleges. It is with sadness that the Department notes the passing on July 28 of John Klein, Professor Emeritus of Mathematics and Computer Science. 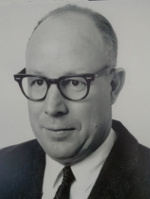 Professor Klein was a member of the HWS faculty from 1964 to 1988. He was instrumental in establishing the Colleges' computer science major, which was first offered in 1984. Klein was born in Ossining, N.Y. His grandfather was Isaac Sharpless, president of Haverford College from 1887 to 1917, who received an honorary degree from Hobart in 1903. Klein received a B.S. in physics from Haverford College and went on to serve as a physicist in the U.S. Navy during World War II. He later earned a master's degree from Massachusetts Institute of Technology and his Ph.D. from University of Michigan, both in mathematics. A scholar, mentor and dedicated member of the faculty, Klein was the Chair of the Department of Mathematics and Computer Science for more than a decade and also served as an Honors adviser. In 1965, he directed a National Science Foundation-funded project to bring to campus an IBM 1130 computer that served both academic and administrative purposes. He was a member of the Mathematical Association of America and the American Mathematical Society. Upon his retirement, the John S. Klein Prize was established in his honor. The prize is awarded to a graduating senior who has demonstrated excellence in computer science. Klein leaves behind his wife of 53 years, Nancy Klein, who also taught at HWS during the early 1980s, specializing in romance studies and linguistics. He is survived by their children, Jeff and Carolyn. 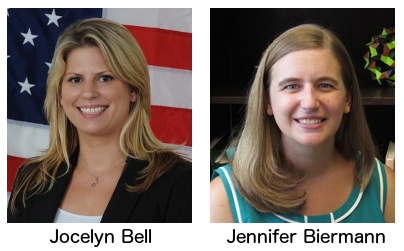 The department welcomes two new faculty members, starting Fall 2016: Jocelyn Bell and Jennifer Biermann. Professor Bell received her Ph.D. in Mathematics, in the field of Topology, from SUNY Buffalo. She held a visiting position at West Point before coming to Hobart and William Smith. Professor Biermann received her Ph.D. in Mathematics, in the field of Commutative Algebra and Combinatorics, from Cornell University. Before joining HWS, she held a visiting position at Mt. Holyoke College.